A painting student has explored the human capacity for atrocity through her work, which is now on display in Aberdeen. 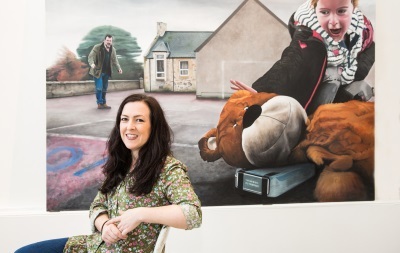 Eve Montgomerie (39), who is originally from Somerset but now lives in Aberlour, has seen her work go on show at the art school’s annual Degree Show which runs until June 25. She said she had tried to shine a light on a subject many people do not like to think about through her paintings. “I think what inspires me is to use my art to have a voice on a subject that I am not only interested in but which maybe people do not tend to discuss,” Eve said. “My practice explores the human condition and our capacity for atrocity, specifically terrorism. A key component to my work is the subtle narratives contained within each painting, often using reflection and text to convey a deeper meaning. “I use a number of decisive concepts to inform my practice, which include the banality of evil and Terror Management Theory, which is a social psychological theory about the role of the unconscious fear of death in just about everything humans do. “In principle, humans are the only animals who have the cognitive ability and acumen that death is unavoidable. This response generates a risk of anxiety, or terror that needs to be managed. The way we have come to adapt to this fear is by believing that we will endure death, usually via different cultural values, such as religion. “We have inclined towards self-preservation through our mechanism of self- esteem. This consists of the belief that one is valued and that life has meaning, usually achieved through cultural belief systems or worldviews. The more you achieve towards these values, the stronger your worldview will become.